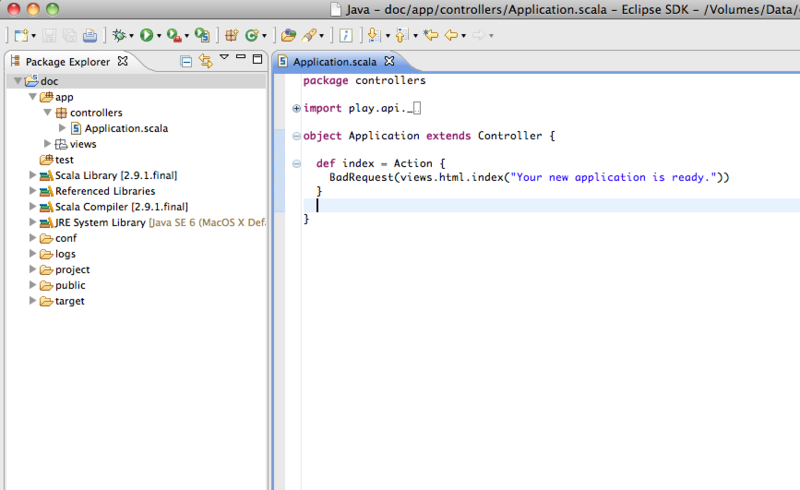 This will create the configuration files IntelliJ needs to open your play application as a project. The files are named .iml and -build.iml. The file menu (IntelliJ 11.1 CE) contains the Open Project command. Run the web app by executing the task run in the Play console. Finally, browse to http://localhost:9000. IntelliJ should stop at your breakpoint. Alternatively, in order not to run more command prompts, first run “play debug run” in IDEA’s Play console, then launch debug configuration. Enter ‘ensime generate’ at the play console. The plugin should generate a .ensime file in the root of your Play project. That’s all there is to it. You should now get type-checking, completion, etc. for your Play project. Note, if you add new library dependencies to your play project, you’ll need to re-run “ensime generate” and re-launch ENSIME.